Gold fell -0.31 [-0.03%] to 1232.99 on heavy volume, while silver rose +0.04 [+0.31%] to 14.57 on very heavy volume. The buck plunged -0.32%, which theoretically should have helped the metals, but didn't. The real winner was the equity market: SPX shot up +2.12%. Today was all about the US midterm elections, which proved to be less destabilizing than feared. It was a "split decision": Republicans picked up seats in the Senate, while the Democrats took over the House. Buried amongst all the stories of an election was the following curious article. Reading between the lines, it hints as to how the futures markets (and especially PM futures) have been systematically manipulated by our friendly banksters. It is all about spoofing: entering (presumably large) orders that were never intended to be executed, which would end up pushing prices in a desired direction. The most interesting part was where the junior trader at JPM, who pleaded guilty, said he learned the techniques from the senior traders at the firm. Any bets this practice was confined to PM? Or just JPM? And isn't still going on? So PM enthusiasts everywhere will rejoice. But here is my question: so why bring this case now? This behavior has clearly been going on for a long time. Obama left the banksters entirely alone for 8 long years to ply their trade. Is this a Trump Action of some sort? Was a junior trader “chicken” killed in order to scare the rest of the bankster monkeys into good behavior? I'm not so sure. Consider: Goldman Sachs prohibited their staff from contributing to the Trump campaign in 2016. HRC, following in Obama's footsteps, was very cozy with the New York banksters. $600,000 30-minute speeches. Coincidentally, 24 months after Trump's election, the banksters are now being subjected to the rule of law. It feels more like payback than law enforcement to me. But who knows - they did pick the PM market in which to enforce the law. Does that mean anything? Wouldn't it be nice if Trump had actually said to his new US attorney: "Go forth and crucify a junior trader at one of the banksters so they will stop hosing the gold market." What's more, they didn't get the guy for a lame charge like "lying to the FBI", they got him to plead to an actual illegal act. So if they tried just a little bit, and were able to flip him, it sure sounds as if they could roll up the whole trading desk. If they wanted to. Wouldn't that be something? Of course if it just ends with this one guy, then we will know they weren't actually trying. Gold rallied along with everything else when the initial election results came in, but the rally didn't last. The high wave candle was neutral, but gold forecaster rose +0.18 to +0.01, which was a buy signal for gold. Gold/Euros looked substantially worse – that's because the euro rallied +0.46% while gold dropped, meaning gold/Euros made a new low. In fact, gold/Euros is now in a downtrend in all 3 timeframes, with the monthly issuing a sell signal just today. A dropping currency was the only thing that kept gold afloat today. That's not a good sign. 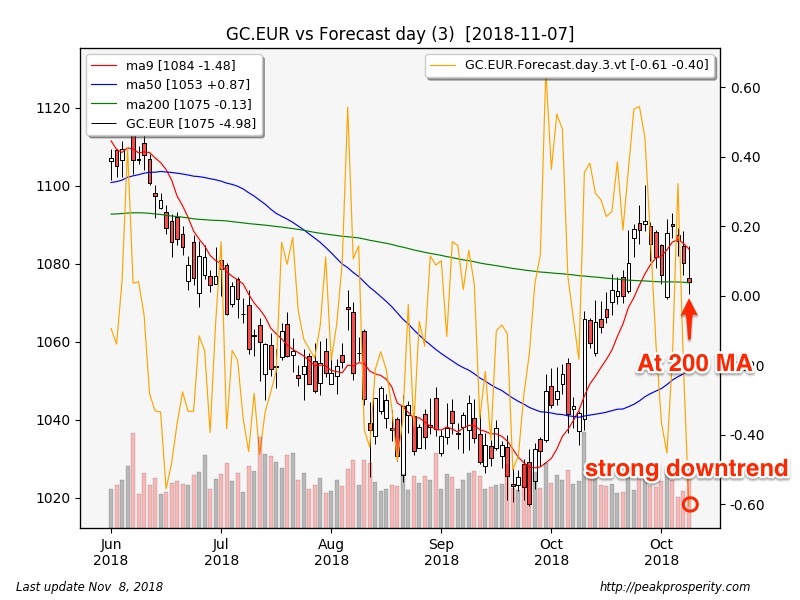 I'm including the GC/EUR chart to show the fading gold rally across the pond. COMEX GC open interest rose +3,195 contracts. Rate rise chances (December 2018) rose to 81% - including a 5% chance of a 0.50 bp hike. Silver rallied along with gold, but was hit with selling too, eventually losing almost all its gains. 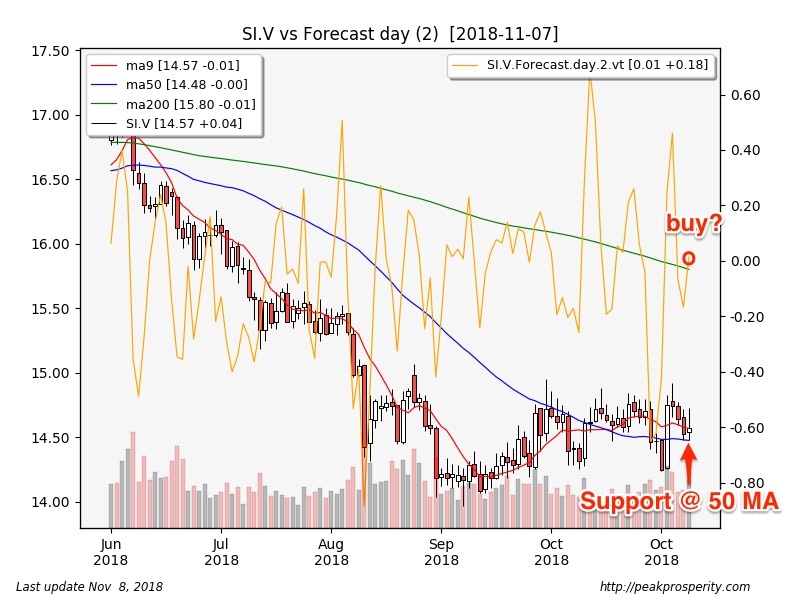 The bullish harami/long white candle was mildly bullish (35% reversal), and forecaster jumped +0.18 to +0.01, which is a tentative buy signal for silver. The modest rally also walked back the monthly sell signal; silver is now (just barely) back into an uptrend in all 3 timeframes. Clearly, silver is struggling for direction, it is right on the edge and it could go either way. COMEX SI open interest rose +1,147 contracts. The gold/silver ratio fell -0.25 to 84.11. That's mildly bullish; the current level for the ratio suggests PM could be at or near a long term low. Miners fell along with gold, with GDX down -0.46% on very light volume, while GDXJ dropped -0.90% on moderate volume. Miners gapped up at the open, and sold off all ay long. XAU fell -1.09%, with the short black/black marubozu candle acting as a bearish continuation. Forecaster didn't agree, rising +0.13 to -0.05. 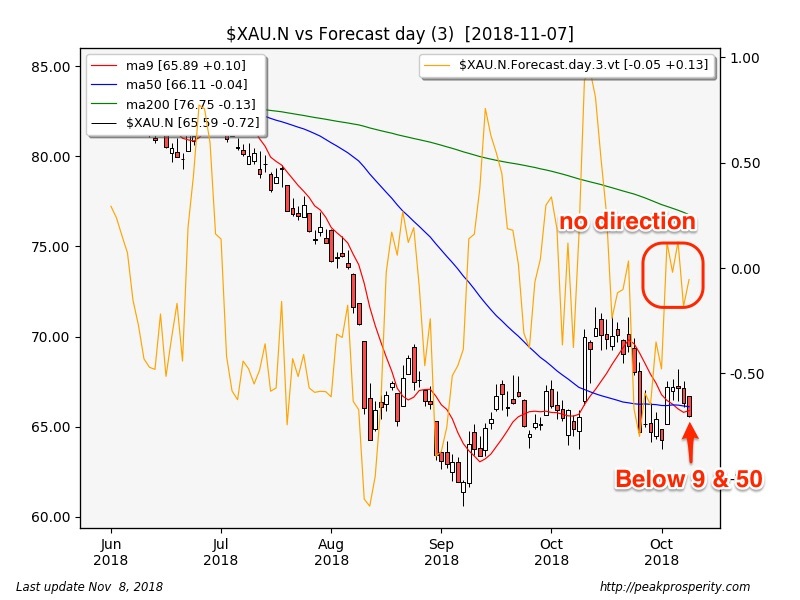 XAU is also struggling for direction; like silver, it could go either way. XAU is in a downtrend in the daily and weekly timeframes, but the trends are not strong ones. The GDX:$GOLD ratio fell -0.44%, and the GDXJ:GDX ratio dropped -0.43%. That's bearish. Platinum rose +0.45%, palladium climbed +1.58%,while copper rose +0.37%. All the other metals did fairly well today, with copper lagging somewhat. The buck fell -0.31[-0.32%] to 95.51. In truth, the buck had a very large trading range, but all the losses came on the gap down open; the long-legged doji candle was neutral, and forecaster moved up +0.04 to -0.17. The buck remains in a daily downtrend, but the weekly and monthly uptrends remain intact. Crude fell -0.20 [-0.32%] to 61.78. It has fallen for 8 straight days. Crude originally rallied along with everything else as an initial reaction to the election results, but the sellers soon appeared, pushing prices back down, making a new low to 61.20. (Remember last month, when price hit $76? That's a 20% decline since then.) The EIA report didn't help at all (crude: +5.8m, gasoline: +1.9m, distillates: -3.5m), and that appeared to be responsible for about $1 of the reversal. The large doji candle was mildly bullish (29% bullish reversal), and forecaster moved up +0.10 to -0.10. In spite of all the selling and the failed rally, the momentum of crude's downtrend is definitely slowing. 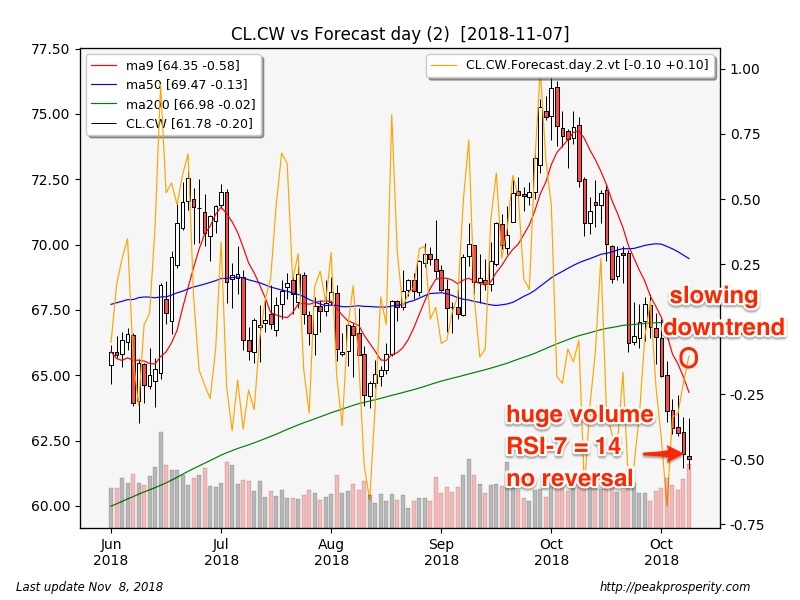 RSI-7 for crude is 14; that is quite oversold. Crude remains in a downtrend in all timeframes. SPX shot up +58.44 [+2.12%] to 2813.89. SPX gained in the futures market overnight, and then had an even stronger intraday rally, closing at the highs. The white marubozu candle was mildly bearish (a 28% reversal), but forecaster rose +0.28 to +0.72, which is a strong uptrend. SPX ended the day well above the 200 MA. SPX remains in an uptrend in the daily and monthly timeframes. Sector map had tech (XLK:+2.94%) and sickcare (XLV:+2.94%) leading, with consumer staples (XLP:+0.57%) bringing up the rear. This was a bullish sector map. VIX plunged -3.55 to 16.36. This plunge tells us that there was a lot of uncertainty surrounding the elections, and that is now being unwound. TLT rose +0.13%; TLT gapped up at the open, but then spent the whole day selling off, closing at the lows, printing a long black candle for the day. Still, the fact that TLT didn't crater what with SPX up more than 2% tells us that election uncertainties were weighing heavily on US treasury debt, alongside the equity market. TY fell -0.11%, which is a new low – TY appears to be headed down to retest the lows set in October. The 10-year yield fell -0.1 bp to 3.21%. JNK shot up +0.48%, with a gap up open and a strong rally for most of the day. Forecaster for JNK is showing a strong uptrend. This lines up with the strong rally in equities following the midterms. CRB rose +0.07%; 4 of sectors rose, led by livestock (+1.75%). Commodities were not the big winners today. Gold continues to weaken in Europe, while equities and junky debt charges higher, relieved from some of the uncertainty of Washington politics. When the recent equity market sell-off started, Armstrong told us that it was election-related. With today's strong rally, this assessment appears to have been borne out as likely true. The bond market was also affected by this uncertainty. The takeaway: if the political divide worsens, we can expect it to affect how the rest of the world views US assets. Now that the elections are past, what is next for the US-China tariff situation? A view from outside the US suggests that – according to a speech given just yesterday - Xi is sticking with the current policy: promising change, but (so far, at least), never actually delivering. And it isn't just Trump that is tired of it. China is seen as long on rhetoric, but short on substance. There is even a phrase for it: “promise fatigue.” It seems as though Xi will continue with the current policies (forced tech transfer, and asymmetric tariffs and industry support) until forced to change. Another article refers to a statement Trump made at a press conference today: “they got rid of 'China 25'”, along with some strong hints that a trade deal was close to being done. The article suggests this might be a deal entirely lacking in substance. China changed the name of the project - “China 2025” - to “China 2035”, and that's about it. What to believe? After the election, Trump doesn't need a political win. Reading the tea leaves, it does sound like progress is being made. Certainly if Trump were alone in the room with Xi, he might be swayed by fig-leaf proposals (not being a “detail person”), but his advisors have already explained the story to him. He doesn't want to have done all this work just to come up with essentially nothing. He could have done that back in May – and initially he was ready to - but he backed away from the deal after he got the full story from his advisors. Six months (and a lot more details) later, I think things are moving closer to resolution. My guess is, the happy noises from Trump are telling us that talks with Xi at the G-20 will probably lead to something concrete - not just a fig-leaf. Say 75% chance. We aren't seeing this play out in copper prices just yet, and certainly not in CNY/USD. However, we might start seeing a move higher as we get closer to the G-20, which starts 3 weeks from today. This could leak over into PM prices also. And now that the US election is past, focus will probably return to Italy's budget, and Italian banks & debt. Salvini's standing in the polls pops every time Brussels tries to impose its will on Italy's government. That speaks to a strong, underlying resentment about the status quo, and a serious flaw in the governance structure of the EU. How often does Washington tell, say, Illinois, that it must pass a particular budget "or else"? And maybe have the elected governor replaced in a soft-coup? And how many times did Washington get a bunch of governors from other states ("the good states") to wag their collective fingers at the recalcitrant Illinois? This sort of stuff just never happens - because each state can go bankrupt all on its own, if it wants to. As a result, there is much less resentment (and much more freedom) for the states to do as they please. This "Imperial Brussels" approach and the entirely-by-now predictable blowback therefrom will have an equally predictable outcome: Salvini will become the leader of Italy. He should send a thank-you card to the tone-deaf unelected EU bureaucrats, whose heavy-handed actions will have almost single-handedly elevated him to power. It just needs a little more time to play out. All that should – theoretically – support metals prices. "a relatively junior employee with the title of vice president"
Dave, do you have any interest in Elliott waves? The DXY appears to be setting up for a 5th leg move higher in a pattern starting from the end of September. It looks like a pretty consistent upward channel. Also the last 2 days of rally *feels* like a decisive signal after the election results. I have bought the dip. I reckon those interest rates are attractive to European capital (which of course is nothing new). I must confess I don't track elliott waves. It would be interesting to see if they actually correlate to price movements over time. That is, I'd be happy to generate them as inputs to my DX model and see if they improved training or not. What's your favorite resource that describes how to use them? FWIW my stuff is supporting your buy-the-dip inclination for the buck. That monthly uptrend sure does seem to be dominating. Also FWIW, back when I was in the trading room services software business, and there were people running trading desks rather than just computers, literally every 5th person on the trading floor was a "vice president." Or, as they would have said, "you can't swing a dead cat without hitting a VP." Trader humor at its best. Elliott Waves - Wikipedia sums up more than my knowledge of it. I certainly do not have tried and tested processes with EWs but from reading blogs, videos, tweets over time I think they are interesting and make sense from a mass physcology perspective. The retracement levels are interesting. There may be a difficulty in testing the theory in that you would need a series of input data to establish a certain pattern in a first step and then secondly test those established patterns for correlations. So I guess you would need to insert a certain criteria in the middle of the analysis which may be a problem using ML type software. You would also have patterns of varying qualities. So I've done simple things that are kinda-sorta in the same area as fib retrace levels. I do percentage from previous high, as well as where the item (roughly) is in the current trading range. Some things benefit from this study, some don't. I always try it out. I typically add stuff to the series, then see if there is any improvement - and I check the correlations. So for the wave stuff if it is just about simple distance from highs and lows, then I could calculate the various levels and see if proximity to these levels resulted in any sort of correlation in terms of directionality. The month timeframes tend to behave a lot more predictably than the weekly or the daily. I've tried "day of week", "day of month", that sort of thing. It doesn't usually help. I even tried "FOMC meeting day" which wasn't helpful. Sadly. In the back of my mind, I have this sense there is order behind the chaos. If you do an FFT of a timeseries (gold, crude, etc) you see all sorts of frequencies off major highs and lows. These just have to be doing something to prices. Armstrong uses them. Sigh. Not enough time in the day.